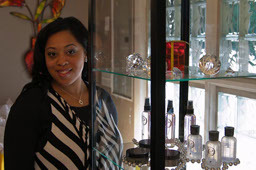 Terra A. Pernell is the owner and operator of Crown Creations by Terra, LLC. Terra graduated from Patterson Career Center's Cosmetology Program, Dayton, OH in 2005, obtained her Cosmetology License and started as an assistant and booth renter with some very talented and giving hair professionals. Terra worked in several salons before moving to her dream position of salon ownership in 2011! Terra is a firm believer in healthy hair with style. Terra specializes in color (including corrective color), silk press, hair extensions, natural hair styles and more! As a salon owner,Terra's goal is to provide a great work environment for the beauty professional while providing value and care to the client!